I stumbled across the below article a little while back, and it was so great I thought I would post the whole thing right here. This is exactly what I have been saying for years! And it’s not too late to join in on the wonder of loose tea. The original article can be find here from the Washington Post. Coffee or tea? A splosh of cultural baggage comes with that choice, offered by banquet servers who tote a carafe of “caf” in one hand and “decaf” in the other. The tea might arrive later, or it might not. If it does, chances are good that a) it was brewed through the machine used for coffee, or b) it comes with a tea bag afloat in tepid water. Weak. Tea is the second-most consumed beverage in the world, after water. But it is a second-class citizen in our nation of hot-liquid drinkers, no matter how much the tea numbers are trending upward. That’s surprising, considering that tea — green as well as black — was the go-to refreshment in America long before colonists dumped 340 chests of it into Boston Harbor. Contrary to popular opinion about a patriotic grudge that sent people on a coffee quest, they kept drinking tea after the Revolutionary War, too; they still had the pots and brewing paraphernalia. These days, the tea bag rules here and in England. Problem is, it’s the coffee equivalent of instant granules. We can do better, America. Nonetheless, Bruce Richardson sees progress. “We are enjoying a tea renaissance right now,” says the author of 14 books on tea and the owner of a tea wholesale business in Danville, Ky. (Also bullish: Starbucks, hence its 2012 acquisition of the robust Teavana chain.) He is convinced that 20-year-olds are getting hip to leaves, coming in to sample single-plantation varieties and blends at his tea bar. “They appreciate the health aspects. . . .When they want to stay up late to read, they should be drinking tea” — not coffee, he says with a paternal air. Perhaps that’s because of tea’s comparatively mild jolt. Typical brewed black teas contain about one-third the caffeine found in coffee (55 vs. 150 milligrams in an eight-ounce serving), yet there’s a contradiction in the cup, as Richardson puts it. True Camellia sinensis, or tea leaves processed differently to create black, oolong, white and green teas, contains L-theanine, an amino acid that helps the brain to simultaneously relax and concentrate. In other words, a little buzz with focus. No wonder tea drinkers feel good about pouring four to six cups per day. Ask a coffee aficionado what he doesn’t like about tea, and the response might be the same as when the question is turned around for a tea lover: bitterness. Although the reasons for bitter coffee are various, the cause of bitter tea is more likely a matter of over-steeping, which might entail using water that’s too hot as well as letting the infusion go on too long. Which leads back to the tea bag, really. Ever since its invention in early 20th-century America, the tidy packet has simplified teamaking. Hands-on prowess with loose-leaf tea has become rare — akin to the mid-century era when Americans’ embrace of convenience foods begat a decline in their kitchen acumen. And the quality of the tea in the bags has been unreliable. Tea brewed via tea bags accounted for more than 65 percent of all tea consumed in the United States in 2012, according to the Tea Association of the USA. Not a surprising position for her to take, given Teaism’s exclusive trade in loose-leaf teas and tisanes, which are herbal infusions (not real tea). However, quality is at the heart of the matter. 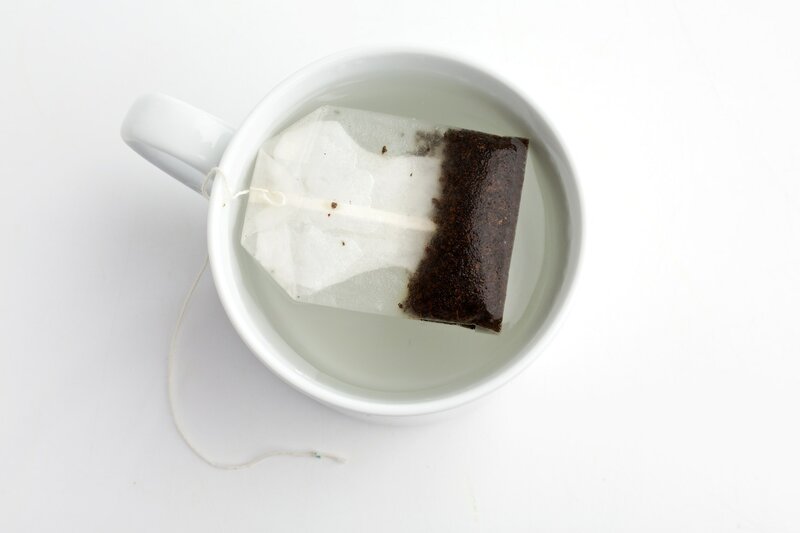 What’s in tea bags “doesn’t come close to the quality of loose-leaf tea. It’s just not of value,” Neumann says. Walk into their Alexandria restaurant and shop, for example, and you can plunk down $15 for a mere 2 ounces of Jinzhen, a Chinese black tea with golden-tipped leaves and a light chocolate aroma in its brew. That works out to about 80 cents a cup. Affordable. Tea has been closely associated with medicinal use and health benefits for centuries. In the past decade or so, consumers have sought out green tea, drawn to its antioxidant properties and studied ability to help prevent cardiovascular disease. So it stands to reason that the full potential of loose-leaf green teas would be preferable to tea bags that can contain little more than tea “dust,” or fannings. Still, the tea has to taste good to keep you interested day after day, which is why sampling and reading descriptions that act like wine shelf talkers will go a long way toward your personal tea education. There are blends with winelike complexity. Committed tea drinkers will go with an eye-opening black tea in the morning and midafternoon, then switch to something milder, decaffeinated or herbal — officially a tisane, not tea — in the evening. Getting familiar with tea brewing basics is key. Black teas are steeped with hotter water than green teas, and each type of tea has a recommended range of steeping times. A good tea shop will include specifics on each package, so there’s no need to commit the information to memory. Experts prefer stainless-steel strainers with deep wells rather than tea balls or chambered teaspoons, so the loose-leaf tea has more room to expand or bloom as it steeps, for optimum flavor. Some teakettles have markings that allow for matching water temperature to tea variety. Travel tumblers and cups for the office sport built-in strainers designed to sit on built-in resting pads. And there is an acceptable alternative to the commercial tea bag: filling your own. Look for individual, biodegradable tea filters made of simple porous paper that are long enough to drape over the edge of a cup. They take seconds to put together. Pyramid-shaped tea sachets (also biodegradable) are gaining in popularity, as well — a good choice that allows the leaves some room to steep. Makes sense. Do you think the popularity of loose leaf will push it out of reach of the average consumer though? This is a great question! I think the trendy loose leaf stores will definitely become inaccessible for the average consumer. I’ve already seen tea prices go up in many of these “trendy” shops, and I haven’t bought as much from them as I used to. ALthough even though the price may seem high, when you think of the per cup price and the fact that you can re-steep tea leaves, the price isn’t that much – especially in comparison to the cost of a beverage at a coffee shop. I do find it adds up for me when I want to buy every flavour! However, there are still many places to buy loose leaf tea inexpensively. I’ve seen it at low prices in bulk stores like Bulk Barn. Eventually, if it becomes popular enough it would be nice to see loose leaf on the shelves of places like Wal Mart, allowing it to be a bit more accessible. My worry though is that if loose tea continues to be marketed with the ideals of upper elite that some people in North American society will resist the change, or stick with tea bags/coffee. Something to keep in mind though is that many cultures already are consuming loose tea and have been for many many years, so it’s mostly the Canada/USA market that it’s becoming “new” to and at risk of being pushed out of reach as you say. Will definitely be interesting to see where the trend goes – thank you for the thought!